clipView is an easy-to-use video browser. With clipView you can easily skip view hundreds of videos using keyboard shortcuts to move backwards and forwards through the currently playing video or, jump to the next video quickly and easily. Take shapshots (single frame images) of any video, create a list of favorites and more. For Best Performance, close any other Video or Graphic intensive application like Quicktime or iTunes for example. If you notice Red flickering quit any other Video or Graphic intensive application while running clipView. 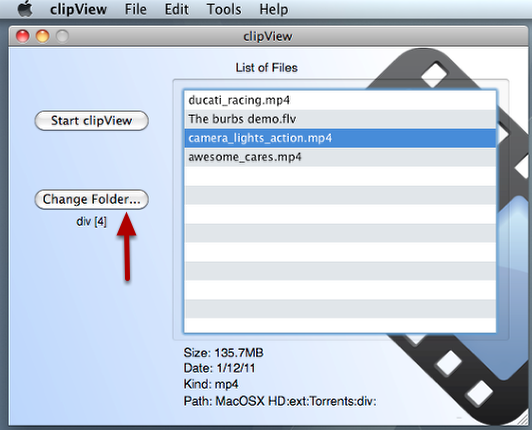 READ THIS FIRST: To get the most out of clipView, try the following right away. Start clipView then while first video is playing, tap the “n” key on your keyboard. This will advance to the next video. After a second or two tap the “f” key to fast forward the video. Now tap “b” to move backwards in the video by approx: 30 seconds. Tap the 1,2 or 3 key to set the delay before clipView plays the next video in the list. The tap Command-K to see a list of short cuts. The shortcut window will close automatically after a few seconds. Tap the “t” key to take a snapshot. Select a folder, then tap “t” repeated to save more snapshots to the same folder. Tap Command-k to check out the other short cuts! Enjoy. clipView gives you the ability to move through a collection of video clips quickly, by tapping keyboard shortcuts. The Randomize File List option (1) will Randomize the File List in the Main Window. This is the order in which Video files will be played. Randomizing the file position (2) will vary the position of the video play back. You can get additional file information by selecting a File in the File List and Choosing Get Info from the Tools Menu. Start clipView by tapping the Start clipView Button, or selecting Start clipView from the File Menu. The first Video in the list will play immediately. The speed at which cllpView loads videos will depend on the speed of your computer. 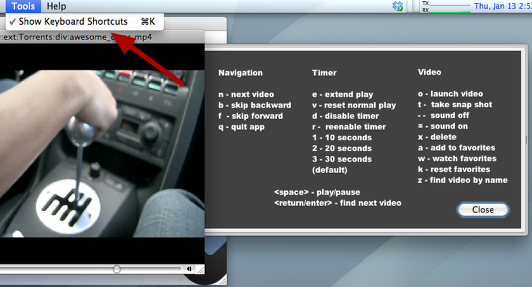 Tap the "n" key while the clipView player is the front most window to move to the next video. By default, the next video in the File List will automatically play in "30 Seconds"
You can Tap the "n" key in rapid succession, however, there may be a delay until the next file is playable because of the time required to load the video. The faster your computer, the faster the file will load. The next video in the List will automatically play after "30" seconds. This can be changed by tapping "1" for 10 Seconds, or "2" for 20 Seconds. You can use the "b" key to move quickly backwards or "f" forwards through the currently playing video. 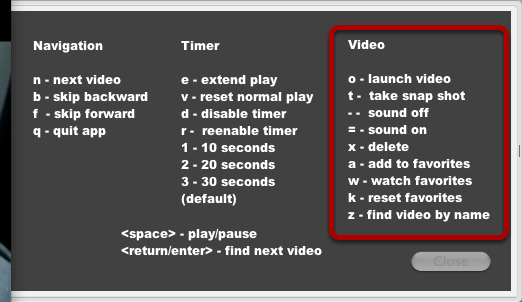 You can display the list of keyboard shortcuts using Command-K.
Navigation Shortcuts allow you to move backwards and forwards quickly within the currently playing video. Tap "n" to view the next video in the list. 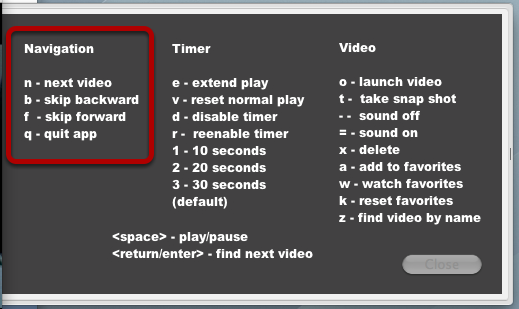 Timer shortcuts allow you to change the auto switch (move to next video) options. By default, the next video in the list will play in 30 Seconds. Tap the "e" key to extend the play time for the currently playing video by 30 seconds. You can disable the timer by tapping "d". This allows you to watch the currently playing movie to the end. Tap the "v" key to re-enable the timer. Additional shortcuts are available to take snapshots, turn sound on/off, and create a list of favorites. Tap "a" to create a list of favorites or load a list that has been previously created. To watch the videos in your favorites list tap "w". note: This will set your file list to favorites. To reset your file list back to normal, tap "k". Tap the "z" key to find video by name. This turns "Find Mode" On. Tap the "esc" key to turn find mode Off. The "z" key turns "Find Mode" On. A [z] key in the Title of the Video will indicate that you are in "Find" Mode. Tap the esc (escape key) to turn find mode off. If found, the Video will begin playing in the clipView player. To find the next occurence press the "Return/Enter" key again. To reset or turn "Find Mode" off – (turn find mode off) tap the "esc" (Escape key) or rapidly tap the "Return/Enter" until no more files are found. Favorites are also kept in this directory. To remove your favorites. Delete this file from the Finder. Always backup your files on a regular basis. 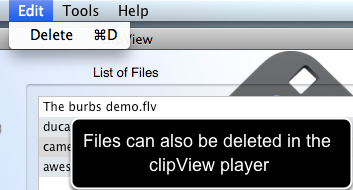 clipView, it’s publisher, or developer is not liable or responsible for any file loss due to the use of this program. To optimize performance, closing any other graphics intensive program, before launching clipView will minimize delay when loading video. 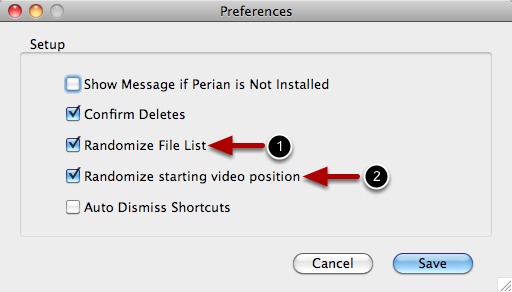 clipView leverages Perian on Mac OS if installed. You can download Perian from http://www.perian.org. 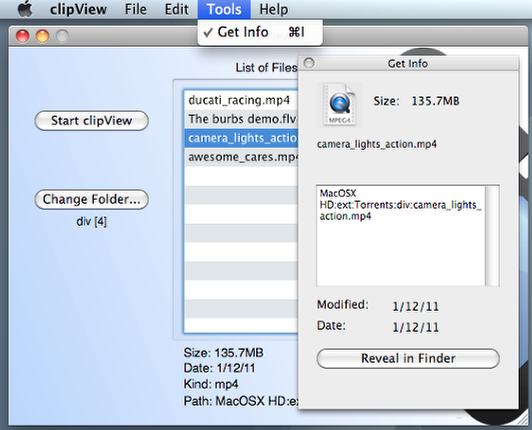 Perian enables Quicktime to open a variety of media file formats. There are times when we want to be reminded to do the same thing on a weekly, monthly, and sometimes daily basis. For example, picking up a tenant rent check every month. Or checking in with our Parents every week (something we workaholics need a task for!). Uncluttered Todos allows you to mark a task as recurring, by enabling “Recurring” from the Edit Todo Screen. 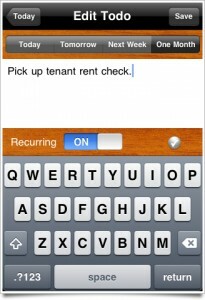 In the screenshot, the “Pick up tenant rent check” will appear on my list every month. So if I complete the task this month. The task will be removed from my list until next month. A daily recurring task will show up on my list every day. A weekly recurring task will show up every week. A monthly recurring task will show up every month. The check box next to the recurring task is the complete, not complete checkbox. It enables you to mark a task complete from the Edit Todo screen. All for now, if you have any questions, or would like additional features please tap the info button on the Home Screen of the Application, there you will be able to send us your comments and questions directly. Thanks. UnclutteredTodos iPhone App is HERE! We love todo applications. We’ve tried then all. We like them all. However, we needed something that helped us manage our time, not our list. Uncluttered Todos allows us to do just that. No more spending time fiddling with colors, folders, screens and other non-productive tasks. 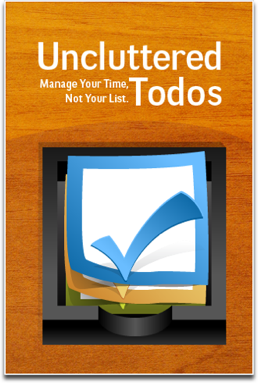 Uncluttered Todos allows you to focus on getting the things on your list completed versus moving todos between folders. More here. 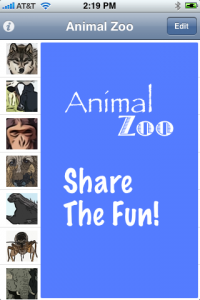 Animal Zoo joined the iTunes App Store ( check it out here ) over a year ago. The response has been terrific. Animal Zoo has the most unique sounds of any mobile application. Thousands of people have downloaded the App and the good news is, all new sounds are free. Use it for school, boring meetings, in the car, on the phone, or just to entertain kids of all ages, hundreds of uses. Download Animal-Zoo now. Isn’t it peculiar that everyone thinks they have a sense of humor? Truth is some people just aren’t funny. So, what do you do when you’re in a conference room with the entire team, and the boss cracks a decidedly unfunny joke? Well, you whip out Animal-Zoo and tap the Crickets button!! Animal-Zoo now available at the iTunes App Store. Send email to animalzoo@ the domain above for questions or support. Welcome to Avenue Mac. We’ve uploaded our first application to the App Store today. Yeah!. The idea was to work our way through the process so we’d know what to expect. The Avenue Mac team develops applications for clients large and small, and sometimes even for ourselves. So it was helpful to go through the process. My goodness there are a lot of steps to publishing an application on iTunes. The good news is, Apple has really done the best job they could in helping developers pull everything they need together before an app is published. In the next few months we hope to blog about some of the trials and tribulations involved in developng an application for the iPhone. In the meantime, download Animal-Zoo and watch this space. Have FUN! Download ClipView from the App Store!